Coach Starks made history as the first African American woman to coach an all ­men’s collegiate team, overcoming many obstacles and silencing many naysayers to bring them to an all ­time record championship season. 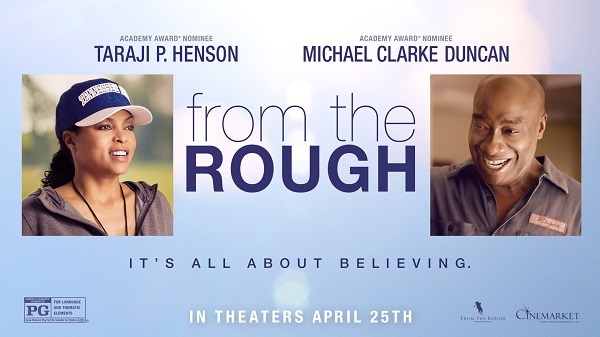 FROM THE ROUGH is one of the last film’s to feature a performance by the late Michael Clarke Duncan. In it, Duncan portrays a quiet force at the university whose presence and constant encouragement helps Coach Starks recall her own strength and draw upon it to succeed. I had the opportunity to participate in an exclusive interview with the stars of the film Taraji P. Henson and Letoya Luckett to hear their viewpoints for their roles in the upcoming movie.